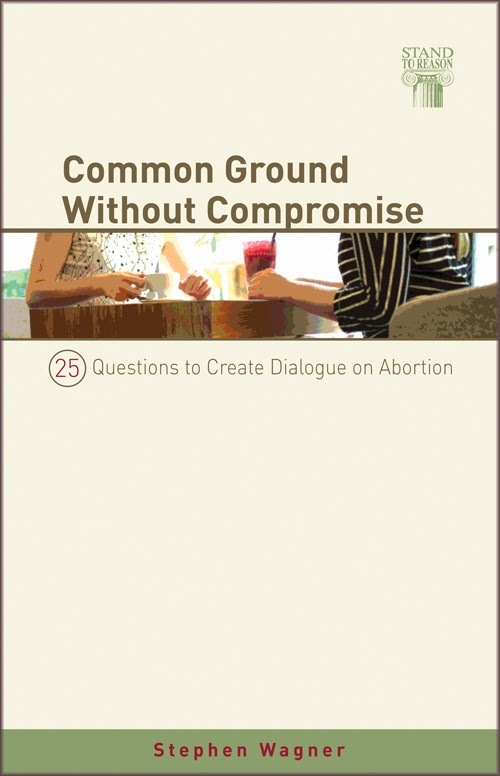 Common Ground Without Compromise: 25 Questions to Create Dialogue on Abortion by Stephen Wagner was published in 2008 by Stand to Reason Press. It is currently out of print, but it’s available for free as an eBook. At a march in Washington, a pro-life activist comes face to face with a pro-choice activist. Their discussion is short and to the point. Or, pointless. There’s a lot of abortion “discussion” among activists — combative rants where the participants talk at each other. Do they listen? Only enough to construct their next volley. What about the rest of us? Are you fed up with shouting people down? Do you want dialogue instead? Are you saddened by the approach that belittles people and attempts to strong-arm them into accepting your ideas? Would you prefer to listen and understand in order to win the privilege to be heard? Common Ground Without Compromise breathes new life into the abortion discussion. Drawing on hundreds of hours of conversation with students on college campuses, Stephen Wagner provides twenty-five questions we can use to find agreement first, along with the civility and goodwill to discuss disagreements. This foundation of common ground provides a safe atmosphere for people on all sides of the issue to clarify their views, listen to alternate perspectives, and even change their minds. Written to both sides of the debate, this book helps pro-life and pro-choice advocates develop their views of abortion and advocate for their positions within a context of friendly dialogue. Common Ground Without Compromise gives average people permission to join the discussion again, without checking either their love for people or their desire for truth at the door. A great book to read as an introduction to the abortion issue or to give to a friend to start a conversation.